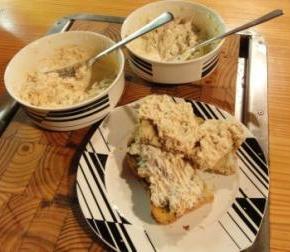 This is my recipe for snoek paté using braaid snoek. So, now you have braaid your snoek, and eaten your fill and there are left overs. This happens every time we braai (bbq) snoek, and if we have the braai on a Saturday, Sunday lunch will be snoek paté with freshly baked bread. You cannot really find snoek in a size suitable for 2 people. We usually braai this when we have friends over for a meal. I love it, except I add chilli jam instead of gooseberry sauce.